Tonia is our Technician and Assistant Team Leader and “the rock” of our team. She always keeps our ducks in a row. 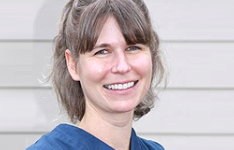 Tonia began working here in 1998 as a veterinary assistant. After graduating from Columbus State Community College in 2002, she became a Registered Veterinary Technician. She has housed all kinds of pets from mice to horses.